Hohmann transfer to Jupiter is about 2 years 8 months. Juno spends 5 years getting there, almost twice as long. I note that it takes Juno 2 years 8 months to get to Jupiter after the Earth flyby, does this mean that it is in a Hohmann trajectory now? How is this gravity assist from Earth helpful? 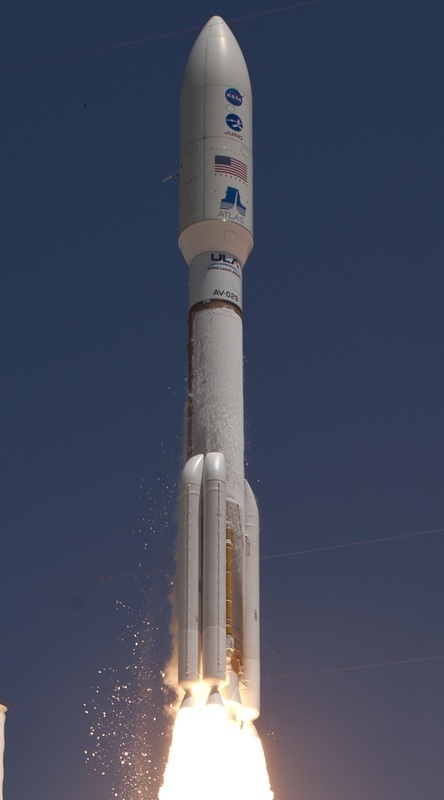 Isn't an Atlas 551 enough to get a 3.6 ton launch mass spacecraft into Hohmann transfer to Jupiter? Was the flyby maybe done in order to help orbital insertion at Jupiter? The Earth flyby was a necessary gravitational slingshot to give Juno the final push to Jupiter. Launch: Juno launched aboard a United Launch Alliance Atlas 551 rocket which is the most powerful Atlas V flown to date. Atlas V supplied a launch energy (C3) of 31.1 km²/s² leaving its payload in a heliocentric orbit with an approximately 2-year period. Deep Space Manoeuvres (DSMs): When coming close to aphelion, Juno performs two large deep space maneuvers. These events are critical mission events of the 2+ dV-EGA mission trajectory because they target Juno's path back to Earth. Theoretically, the DSMs could be performed with a single burn which would actually provide a better net result in terms of required delta-V, but the burn was cut in half since the Leros 1b main engine of the spacecraft was not qualified for 60-minute burns prior to Juno's launch. Earth Flyby: For the Flyby, more instruments will be turned on to acquire science data from Earth's environment, both, for calibrations and to support other studies. An additional benefit of the flyby is to give mission controllers the opportunity to practice operating the instruments and the spacecraft in general in preparation for the science mission. 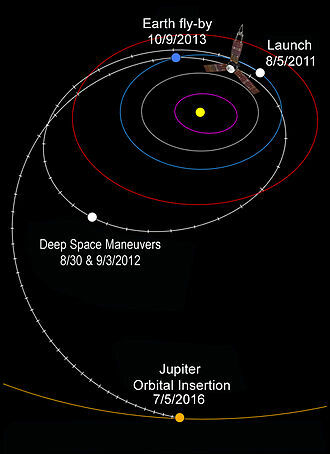 Earth flyby occurs on October 9, 2013 with the exact timing depending on the final trajectory maneuvers. 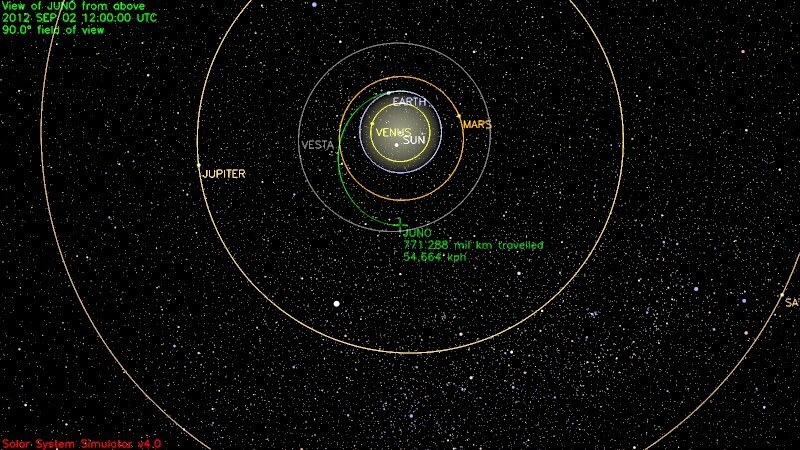 Juno will be coming as close as 559 kilometers. Perigee occurs 200 kilometers off the southeastern coast of South Africa. The gravity assist flyby supplies Juno with a delta-V (velocity change) of 7.3 kilometers per second (26,280 kph, 16,330 mph). With its additional velocity, Juno's orbit around the Sun is modified in a way that takes the vehicle's aphelion outside Jupiter's orbit, crossing its orbit at the correct time to intercept the planet. The gravity assist flyby will mark the only time on Juno's mission that the vehicle is in full eclipse as it passes through Earth's shadow. Eclipse time is about 20 minutes and Juno charges its batteries to 100% before the event so that there are no concerns regarding electrical power. I believe the following may be helpful. The Voyager probes weighed about 825 kg and the Titan IIIE booster could boost 15,400 kg to low Earth orbit (LEO). The Juno probe, in contrast, weighs 3,625 kg, and the Atlas 551 booster used to launch it is only capable of 18,814 kg to low Earth orbit, a substantially less boost to payload mass ratio. I'm sure this is over-simplifying, but it seems the boost to weight ratio is a decent indicator of how far past LEO the booster is capable of. The higher the ratio, the more the booster has left upon reaching LEO and heading out to Jupiter. Juno weighed around four times as much as Voyager, but its booster was only about one third more powerful. Somewhere in between would lie the threshold for a faster transit to Jupiter. Not the answer you're looking for? Browse other questions tagged orbital-mechanics jupiter flyby juno or ask your own question. Is it easier to land on Europa/Io than on Mars? What are the main considerations?